This new fender clip has become one of the fastest growing boat accessories on the market. Fastfenders were designed by a disabled individual whose need was for one hand application. Anyone can hang, adjust and reposition boat fenders rapidly and with little effort like never before. Fastfenders are guaranteed to make your boating more fun and easy. 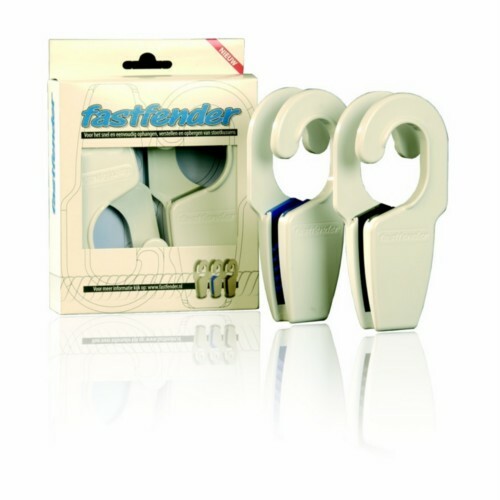 They are the ultimate solution for boaters who need to hang & adjust medium to heavy marine fenders with ease and quick. on 4/3/2012 Best so far. I have been looking for fender hangers. This is the one solved many of my fender hanging issues. on 3/15/2010 These are the best! By far the easiest clips I have ever used. My wife loves them; she can clip with one hand.